BERLIN - Lynne Gavrilis had worked at several small businesses, and then she went to a massage school orientation with her daughter. “I said, ‘Wow, I like this,’ ” she recalled. “I thought, ‘This is really great. If I ever get a chance to do it, I want to do it,’” she said. That opportunity came in 2011 when she took over Natural Balance Massage in Newington. With the owners of the Newington building wanting the space for themselves, and an alternative they provided not sufficient to her needs, Gavrilis recently moved the business to 369 New Britain Road in Berlin, which had been vacated by an eyeglass shop. “We are so pleased to see another business open in Berlin which helps people to feel better and be healthier,” said Economic Development Director Chris Edge. Gavrilis said her massage place offers a low-stress environment, unlike more corporate parlors that go heavy on promotions and try to get people in and out quickly. “We try to be very communicative,” said Gavrilis after a ribbon cutting earlier this month. Natural Balance Massage keeps a record of customers’ preferences and allows other staff members to fill in for regular massage therapists in their absence. “If they come in and don’t like having their feet touched, we don’t need them to tell us they don’t like their feet touched. We know,” said massage therapist Dottie Mannings. 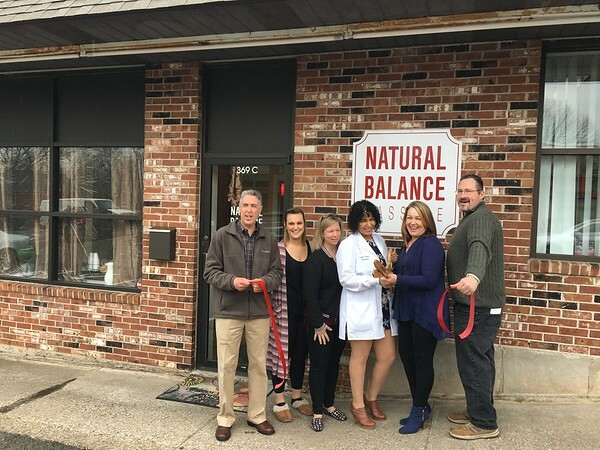 The shop has rooms for couples and singles, with add-on services and no-contract membership costs available online at ctnaturalbalance.com, Gavrilis said. Renting a room in Natural Balance’s space is Vidalia Valentino’s business, Vivacious Look, which offers facials, skin treatments, waxing, eyebrow microblading and eyelash extensions. “It’s kind of like a spa,” Grevalis said of the two working together. Natural Balance Massage is open Monday through Saturday. For more information, visit ctnaturalbalance.com or call 860-357-4315. Posted in New Britain Herald, Berlin, Business on Thursday, 24 May 2018 21:09. Updated: Thursday, 24 May 2018 21:11.